Internal consistency is high (0.92 Cronbach’s alpha) and test-retest reliability is high of a 3-month period. Validity is reflected in high correlations with measures of pain-related disability, different coping strategies, and another more activity-specific measure of self-efficacy beliefs, the Self-Efficacy Scale. The evidence of the PSEQ’s sensitivity to change provides support for its construct validity. Vong et., (2009) conducted a validation study using a Chinese sample with a mean age of the 120 participants (39 men, 81 women) was 41.9 years. The mean duration of pain was 31 months. The pain locations included the lower back (n=47, 38.3%), neck (n=11, 9.2%), shoulder (n=10, 8.3%), knee (n=8, 6.7%), foot (n=8, 6.7%), wrist (n=3, 2.5%), and other areas (n=14, 11.6%). Among the participants, the mean of total Chinese Pain Self- Efficacy Questionnaire score was 40.1 (SD 11.0). It demonstrated good internal consistency reliability and construct-related validity. Scores can range from 0 – 60 and is done by simple addition. High PSEQ scores are strongly associated with clinically-significant functional levels and provide a useful gauge for evaluating outcomes in chronic pain patients. Scores around 40, as found in injured workers who returned to work (Cohen et al, 2000; Adams and Williams, 2003) are associated with return to work and maintenance of functional gains, whilst lower scores after treatment (e.g., 30) tend to predict less sustainable gains (Couglan et al, 1995). 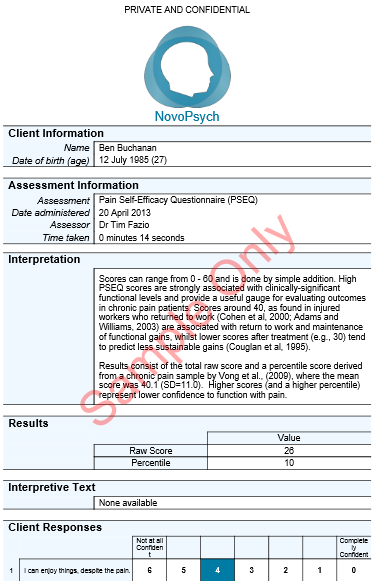 Results consist of the total raw score and a percentile score derived from a chronic pain sample by Vong et al., (2009), where the mean score was 40.1 (SD=11.0). Higher scores (and a higher percentile) represent lower confidence to function with pain. Nicholas, M. K. (2007). The pain self-efficacy questionnaire: Taking pain into account. European Journal of Pain, 11(2), 153-163.